Hardware accessory kit provides a convenient and safe way to hang your hammock from wooden supports or trees. 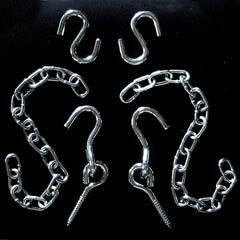 Allows fine-tuning of the hanging tension to perfectly suit your personal preference. 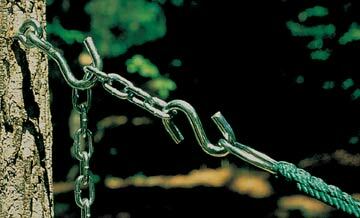 Contains two 20 inch lengths of welded chain, two S-hooks, and two screw hook assemblies, plus instructions. Heavy-duty steel hardware supports up to 450 lbs. Please note that all hammocks ship with one complete hanging hardware kit included.